ATM maker NCR Corp. says it is seeing a rapid rise in reports of what it calls “deep insert skimmers,” wafer-thin fraud devices made to be hidden inside of the card acceptance slot on a cash machine. KrebsOnSecurity’s All About Skimmers series has featured several stories about insert skimmers. But the ATM manufacturer said deep insert skimmers are different from typical insert skimmers because they are placed in various positions within the card reader transport, behind the shutter of a motorized card reader and completely hidden from the consumer at the front of the ATM. Deep insert skimmers removed from hacked ATMs. 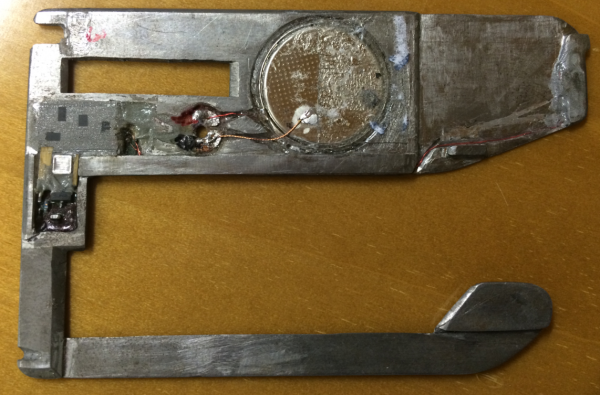 NCR says these deep insert skimming devices — usually made of metal or PCB plastic — are unlikely to be affected by most active anti-skimming jamming solutions, and they are unlikely to be detected by most fraudulent device detection solutions. “Neither NCR Skimming Protection Solution, nor other anti-skimming devices can prevent skimming with these deep insert skimmers,” NCR wrote in an alert sent to banks and other customers. “This is due to the fact the skimmer sits well inside the card reader, away from the detectors or jammers of [NCR’s skimming protection solution]. 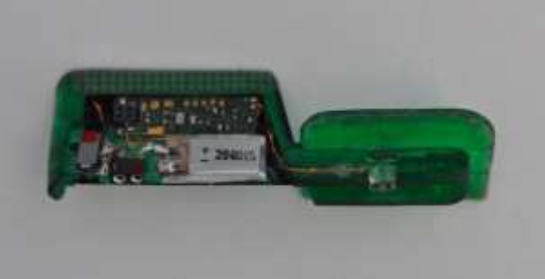 The company said it has received reports of these skimming devices on all ATM manufacturers in Greece, Ireland, Italy, Switzerland, Sweden, Bulgaria, Turkey, United Kingdom and the United States. 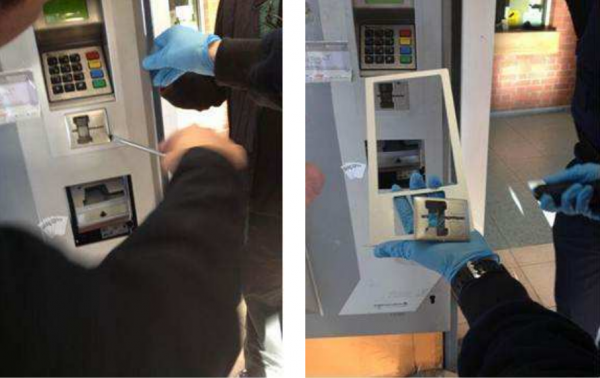 “This suggests that ‘deep insert skimming’ is becoming more viable for criminals as a tactic to avoid bezel mounted anti-skimming devices,” NCR wrote. The company said it is currently testing a firmware update for NCR machines that should help detect the insertion of deep insert skimmers and send an alert. Charlie Harrow, solutions manager for global security at NCR, said the early model insert skimmers used a rudimentary wireless transmitter to send card data. But those skimmers were all powered by tiny coin batteries like the kind found in watches, and that dramatically limits the amount of time that the skimmer can transmit card data. Last month, media outlets in Malaysia reported that organized crime gangs had stolen the equivalent of about USD $1 million with the help of malware they’d installed on at least 18 ATMs across the country. Several stories about the Malaysian attack mention that the ATMs involved were all made by ATM giant NCR. To learn more about how these attacks are impacting banks and the ATM makers, I reached out to Owen Wild, NCR’s global marketing director, security compliance solutions. Wild said ATM malware is here to stay and is on the rise. BK: I have to say that if I’m a thief, injecting malware to jackpot an ATM is pretty money. What do you make of reports that these ATM malware thieves in Malaysia were all knocking over NCR machines? 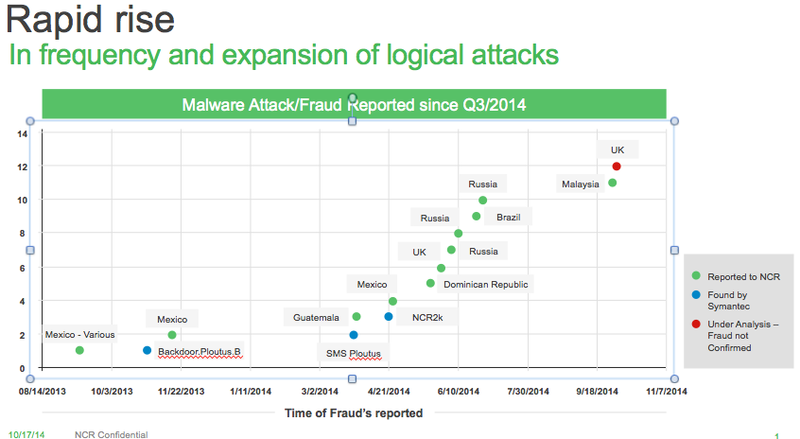 OW: The trend toward these new forms of software-based attacks is occurring industry-wide. It’s occurring on ATMs from every manufacturer, multiple model lines, and is not something that is endemic to NCR systems. In this particular situation for the [Malaysian] customer that was impacted, it happened to be an attack on a Persona series of NCR ATMs. These are older models. We introduced a new product line for new orders seven years ago, so the newest Persona is seven years old. BK: How many of your customers are still using this older model? OW: Probably about half the install base is still on Personas. BK: Wow. So, what are some of the common trends or weaknesses that fraudsters are exploiting that let them plant malware on these machines? I read somewhere that the crooks were able to insert CDs and USB sticks in the ATMs to upload the malware, and they were able to do this by peeling off the top of the ATMs or by drilling into the facade in front of the ATM. CD-ROM and USB drive bays seem like extraordinarily insecure features to have available on any customer-accessible portions of an ATM. OW: What we’re finding is these types of attacks are occurring on standalone, unattended types of units where there is much easier access to the top of the box than you would normally find in the wall-mounted or attended models. BK: Unattended….meaning they’re not inside of a bank or part of a structure, but stand-alone systems off by themselves. BK: It seems like the other big factor with ATM-based malware is that so many of these cash machines are still running Windows XP, no? This new malware, detected by Kaspersky Lab as Backdoor.MSIL.Tyupkin, affects ATMs from a major ATM manufacturer running Microsoft Windows 32-bit. The bank that shared these photos asked to remain anonymous, noting that the incident is still under investigation. But according to an executive at this financial institution, the skimmer below was discovered inside the ATM’s card slot by a bank technician after the ATM’s “fatal error” alarm was set off, warning that someone was likely tampering with the cash machine. 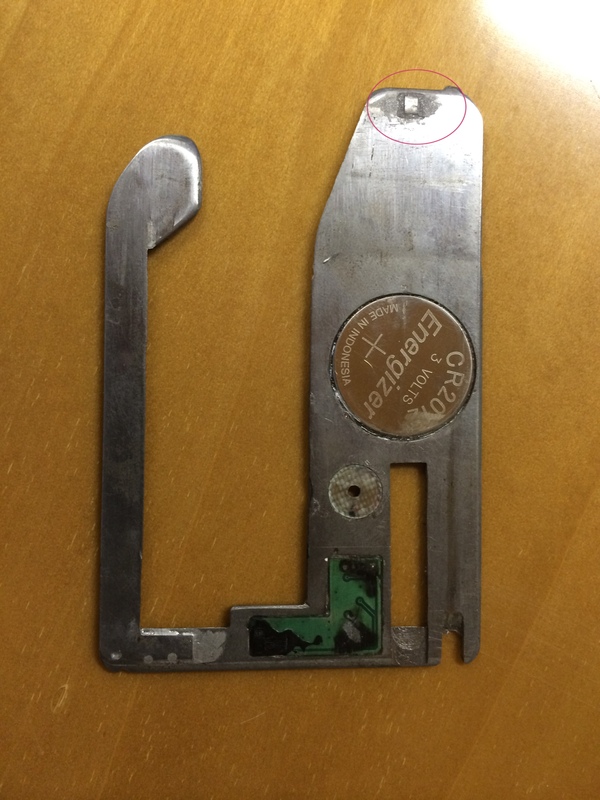 A side view of the stainless steel insert skimmer pulled from a European ATM. The backside of the insert skimmer reveals a small battery (top) and a tiny data storage device (far left). Flip the device around and we get another look at the battery and the data storage component. The small area circled in red on the left in the image below appears to be the component that’s made to read the data from the magnetic stripe of cards inserted into the compromised ATM. Like most electronic gadgets these days, ATM skimmers are getting smaller and thinner, with extended battery life. 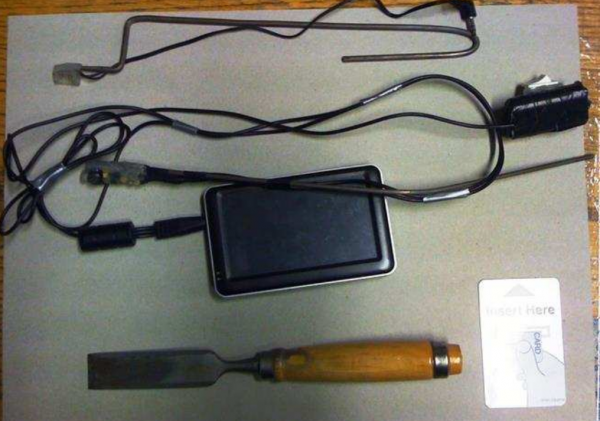 Here’s a look at several miniaturized fraud devices that were pulled from compromised cash machines at various ATMs in Europe so far this year. According to a new report from the European ATM Security Team (EAST), a novel form of mini-skimmer was reported by one country. Pictured below is a device designed to capture the data stored on an ATM card’s magnetic stripe as the card is inserted into the machine. While most card skimmers are made to sit directly on top of the existing card slot, these newer mini-skimmers fit snugly inside the card reader throat, obscuring most of the device. 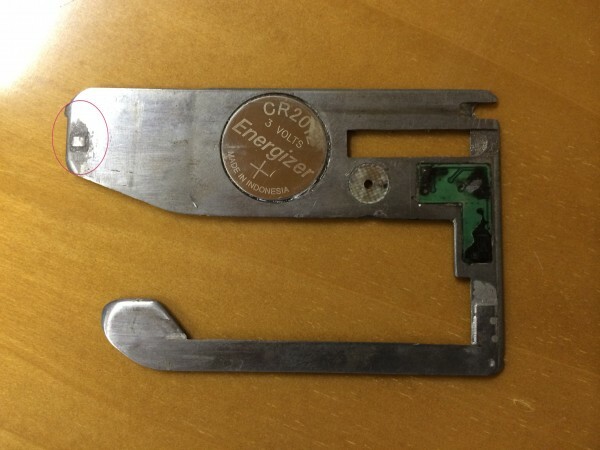 This card skimmer was made to fit inside certain kinds of cash machines made by NCR. A mini-skimmer designed to slip inside of an NCR ATM’s card acceptance slot. Image: EAST. “New versions of insert skimmers (skimmers placed inside the card reader throat) are getting harder to detect,” the EAST report concludes. The miniaturized insert skimmer above was used in tandem with a tiny spy camera to record each customer’s PIN. The image on the left shows the hidden camera situated just to the left of the large square battery; the photo on the right shows the false ATM fascia that obscures the hidden camera as it was found attached to the compromised ATM (notice the tiny pinhole at the top left edge of the device). The hidden camera used in tandem with the insert skimmer. Source: EAST. EAST notes that the same country which reported discovering the skimmer devices above also found an ATM that was compromised by a new type of translucent insert skimmer, pictured below. A translucent mini-skimmer made to sit (mostly) inside of an ATM’s card acceptance slot. Source: EAST. Experts in the United States and Europe are tracking a marked increase in ATM skimmer scams. But let’s hope that at least some of that is the result of newbie crooks who fail as hard as the thief who tried to tamper with a Bank of America ATM earlier this week in Nashville. Nashville police released a series of still photos (which I made into a slideshow, below) that show a man attaching a card skimming device to a local ATM, and then affixing a false panel above the PIN pad that includes a tiny video camera to record victims entering their PINs. According to Nashville NBC affiliate WSMV.com, this scammer’s scheme didn’t work as planned: The card skimmer overlay came off of the ATM in the hands of the first customer who tried to use it. As you can see in the image montage, the first would-be victim arrives less than seven minutes after the thief installs the skimmer. The story doesn’t state this, but the customer who accidentally pulled the card skimmer off of the ATM actually drove off with the device. Interestingly, the fraudster returns a few minutes later to salvage what’s left of his kit (and perhaps his pride). As lame as this ATM skimming attempt was, a few aspects of this crime are worth highlighting because they show up repeatedly in skimming attacks. One is that the vast majority of skimming devices are installed on Saturdays and Sundays, when the crooks know the banks will be closed for at least a day. As a result, you have a much higher chance of encountering a skimmer if you regularly use ATMs on a weekend. Second, the thieves who install these fraud devices very often are lurking somewhere nearby — to better keep an eye on their investments. If you ever happen to discover a skimming device attached to an ATM, just remember that while walking or driving off with the thing might seem like a good idea at the time, the miscreant who put it there may be watching or following you as you depart the ATM area. Once or twice a month I am interviewed by various news outlets about ATM skimming attacks, and I’m nearly always asked for recent figures on the incident and cost of these crimes. Those stats are hard to come by; I believe the last time the U.S. Secret Service released figures about the crime, it estimated that annual losses from ATM fraud totaled about $1 billion, but that was for 2008. Today’s figures are almost certainly higher. On Tuesday, Verizon Enterprise Solutions released its annual data breach investigations report, a deep dive into more than 620 data breaches from the past year. Interestingly, this year’s report shows that of the Top 20 Threat Actions the company tracked across all of the breaches from 2012, physical tampering was the most frequent cause — present in more than 30 percent of all incidents detailed in the report. Credit and debit card skimmers aren’t just for ATMs anymore. According to European anti-fraud experts, innovative skimming devices are turning up on everything from train ticket kiosks to parking meters and a host of other unattended payment terminals. Recently, at least five countries reported skimming attacks against railway or transport ticket machines, according to the European ATM Security Team (EAST), a not-for-profit organization that collects data on skimming attacks. 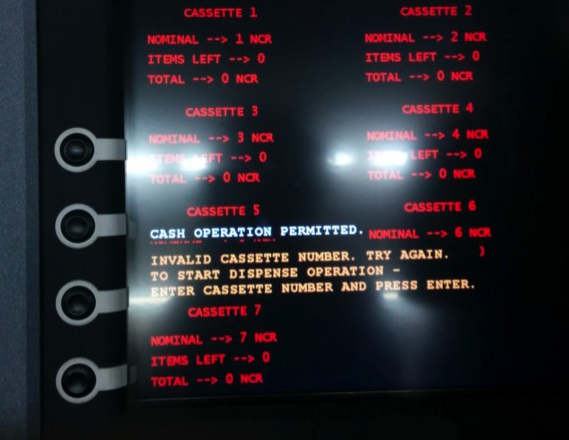 Two countries reported skimming attacks at parking machines, and three countries had skimming incidents involving point-of-sale terminals. EAST notes that Bluetooth devices increasingly are being used to transit stolen card and PIN data wirelessly. 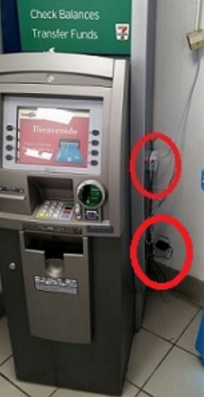 The organization also is tracking a skimming trend reported by three countries (mainly in Latin America) in which thieves are fabricating fake ATM fascias and placing them over genuine ATMs, like the one pictured below. After entering their PIN, cardholders see an ‘out-of-order’ message. 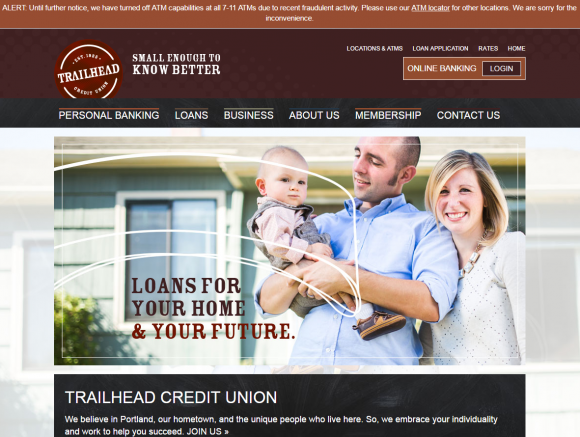 EAST said the fake fascias include working screens so that this type of message can be displayed. The card details are compromised by a skimming device hidden inside the fake fascia, and the PINs are captured via the built-in keypad, which overlays the real keypad underneath.